"Daisy the Bull-Pei at 19 months old. She weighs about 65-70 pounds and is still a puppy at heart. She is very much a 'social' dog and loves people and other dogs. She is still a great pet and is 'Queen' of our house!" The Bull-Pei is not a purebred dog. 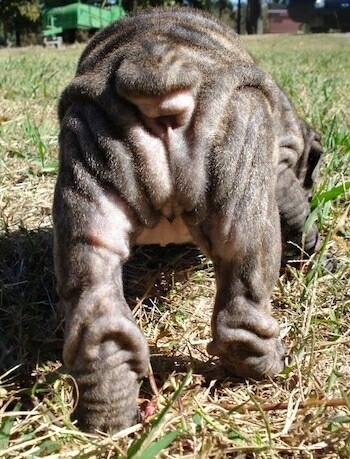 It is a cross between the English Bulldog and the Shar-Pei. The best way to determine the temperament of a mixed breed is to look up all breeds in the cross and know you can get any combination of any of the characteristics found in either breed. Not all of these designer hybrid dogs being bred are 50% purebred to 50% purebred. It is very common for breeders to breed multi-generation crosses. "This is Daisy, our 65 pound, Bull-Pei at 19 months old. She has spent the day protecting our house, chasing squirrels and lizards, and barking at passing dogs. Now she has eaten her belly full and retired for a nap! She plays hard and sleeps hard. It's not unusual for her to wake us up during the night snoring. What a face!" Daisy the Bull-Pei at 10 months old—"Her daddy is a white English Bulldog and her mama is a brown Shar-pei. She is a very friendly dog and loves people, dogs and even cats. She never meets a stranger and can be very entertaining. She drinks from a bird bath and loves to hang over the tub and watch it fill up with water. She was very easy to housebreak, but prefers the outside. She loves to go on walks. She has a very muscular body and a soft coat. Overall, she is a great pet and this seems to be a good combination of breeds." 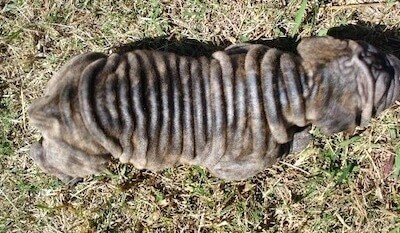 Yazmin the Bull-Pei puppy at 7 weeks old—"Yazmin is a beautiful lilac brindle female Bull-Pei. She has tons of wrinkles and a nice, short coat. She is one of the pups from my current litter." Yazmin the Bull-Pei puppy at 7 weeks old walking around in the grass. "This is our newest family member, a Bull-Pei named Matilda. She is 8 weeks old in these pictures. 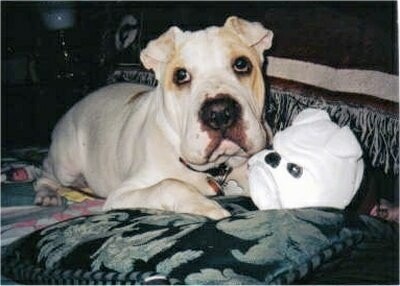 Her mother was a purebred English Bulldog and father a purebred Shar Pei. Her coat is all black. Inside her mouth is a tint of blackish blue on her top pallet and some black spots under her tongue. 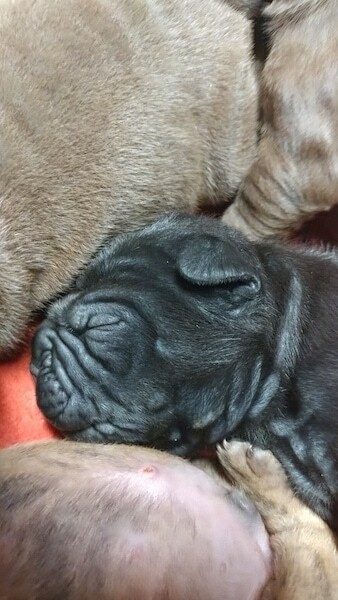 I wanted an English Bulldog and my husband wanted a Shar Pei so we met in the middle hoping that she will not have any of the major health problems from either breed. Although when we go to welcome another new family member into our home I believe we will go with a breeder who is looking to better the breed itself and stick with purebred. After all the back and forth I've read on the internet of people bashing each other over the mix of the two breeds. Of course pure dedication and proper training with time will tell. We believe in giving her the best chance at life and in doing so she is on high quality food and has a vet just a few blocks down the road. I believe if its a mixed breed or a purebred you should always give them the best chance at life. Although if everyone thought that way there would be no dogs in shelters either. Also be careful what you are getting yourself into with the mix of these two breeds, you may end up with an alpha and one very stubborn little pup. With proper training and hopefully she will find her place in our home and enjoy her life. I have been watching a lot of Cesar Millan and I am using a lot of his techniques to help with training." Matilda the black Bull-Pei puppy at 8 weeks old with her toy. Matilda the black Bull-Pei puppy at 4 months old—"Matilda is a Bull-Pei, her mother was a pure English Bulldog and her father was a pure Shar Pei. We brought our babygirl home when she was 8 weeks old. She is amazing around children of all ages and loves playing with dogs of all sizes. Cats on the other hand not so much she cries for them and is very interested but they don't like how she snorts all over them lol. One thing is for sure, when ever I get up in the middle of the night you can be sure to find her in my spot once I return!!! She is always trying to steal my spot at night!!!" 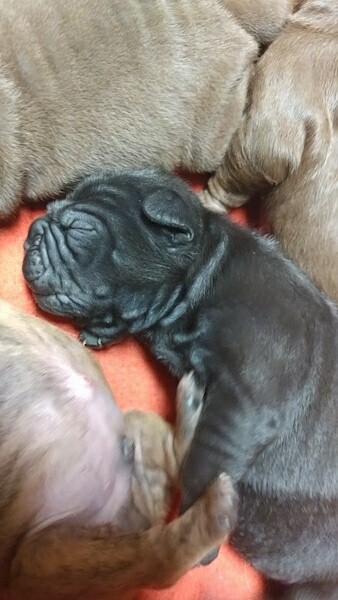 "This is a 4 week old female Bull-Pei puppy located in Alabama. 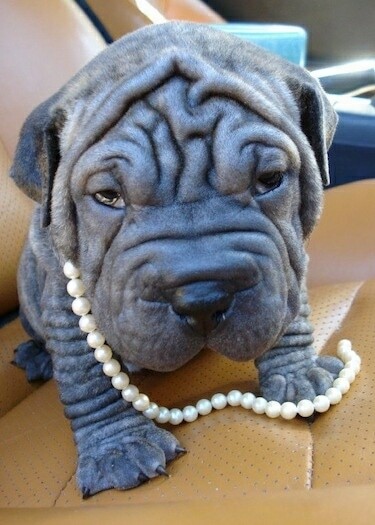 It is a designer breed cross of Chinese Shar Pei and the English Bulldog. They are solid build, with thick necks, muscular and triangular in shape and are energetic engaging loyal companions. 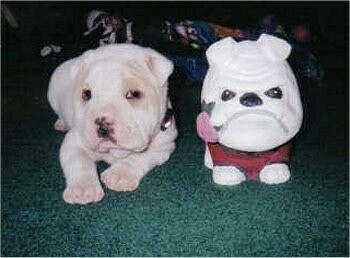 They have lots of wrinkles and loose skin but not all the health issues of a purebred English Bulldog. JJ the Bull-Pei puppy at 5 weeks old—"JJ is a chocolate/blue fawn Bull-Pei. A Bull-Pei is a cross between an English Bulldog and a Chinese Shar Pei. They are stout, solid fun loving loyal pets. I love their wrinkles!" 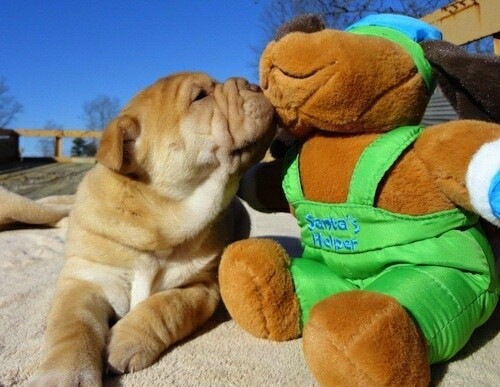 Sugar the Mini Bull-Pei as a puppy at 3 weeks old—"Sugar is an English Bulldog mixed with a Mini Shar-Pei."